Impossible: where have the women disappeared to? An ensemble magic show featuring multiple performers doing different kinds of tricks, from huge illusions (yes, a car vanishes, a helicopter appears) to card and coin tricks. It was packed, the audience loved it, and the 12 year-olds with me pronounced it “awesome”. This is surely west-end gold. 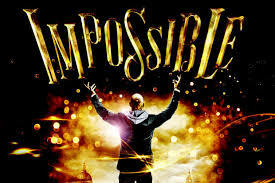 For a start, you don’t need much English to watch a magic show, and it’s very family-friendly (even the ticket prices are lower than the west-end standard). From a producer’s point of view, the ensemble nature of the show means than no performer is irreplaceable. The magic was baffling, funny, slick and pretty much flawless in execution. Maybe it’s because (wisely) almost the whole programme was built around tricks that have been around for decades if not centuries – what magicians call “classics”. I’ve been into magic almost my whole life and there were very few illusions here that I haven’t seen – in one way or another – before. From Ben Hart’s opening “Diminishing Cards”, through Jamie Allen’s “sawing a lady in two” (OK, he used a “laser beam”, but it’s the same trick), to Ali Cook’s Houdini routine: these are classics but still look fresh and mystifying. Funniest of all is that the trick that truly captivated the boys I was with was not the helicopter, or the mind-reading, or any one of the (frankly FAR too many) boxes in which pretty girls underwent myriad contortions and transformations, but a simple card trick performed by Luis de Matos involving all the audience which provoked gasps of amazement and delight. For me, though, the biggest mystery was the absence of the only woman of the troupe, Katherine Mills. What on earth happened there? She was in all the pre-publicity. She’s in the brochure. She never made it much past the first night. Done. Gone. Vanished. And keeping very schtum on FB and Twitter. The remaining line-up is all men, plus their compulsory “glamorous assistants”. I’m the very last person to bleat on about “sexism”. It didn’t strike me as sexist, just…old fashioned. Despite the jeans-and-t-shirt chic, the magic with iPads and all the rest of it, the curtain call demonstrated that live magic has yet to get fully comfortable in the 21st century. This entry was posted on August 13, 2015 at 9:53 am and is filed under magic, theatre. You can follow any responses to this entry through the RSS 2.0 feed. You can leave a response, or trackback from your own site.